Emma Jane was majoring in political science and sociology at Penn State when she had the opportunity to become the first woman foreign exchange student to travel to Lingham University in Canton, China, in 1935-1936. She returned to the US, knowing that she wanted to do something to give back to the Chinese people. She received her B.A. 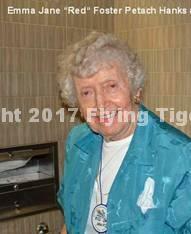 from Penn State in 1937, her Masters in Nursing from Yale School of Nursing in 1940, and worked for the Minneapolis Nursing Association. When she learned that Major Thomas Gentry was trying to put together a medical team for Claire Chennault and the AVG, she knew that was what she wanted to do. Twenty-four hours after being contacted, she was on her way back to China. Miss Foster traveled to China on the Jagersfontein where she met John “Pete” Petach. She and Pete liked to listen to music together and became good friends. Emma Jane was the only RN to serve in China with the AVG. She and Jo Buckner Stewart spent their time helping the three physicians and taking care of the men with dengue fever and malaria, and those who were injured in various accidents. On February 16, 1942, she and Pete Petach were married by AVG Chaplain Paul Frillmann, with the blessing of Chennault, in Kunming, China. When the AVG was disbanded on July 4, 1942, some of the members agreed to help Chennault by remaining for an additional ten days. Pete and a pregnant Emma Jane agreed that he should stay. A few days later, on July 10th, John Petach was killed while leading a 4-ship bombing and strafing mission over Nanchang, China. Emma Jane Foster Petach returned to the United States in the company of her good friends Charlie Bond and Bob Neale. In February, 1943, she gave birth to Joan Claire Petach (the Claire was for Claire Chennault). Throughout the remainder of the war, she continued in her nursing career and taught for two years in the Yale School of Nursing. She continued in her nursing career in various capacities, including in Pennsylvania Public Health and as Executive Director of the Pennsylvania Health Council. In 1964, she married Fletcher Christian “Christy” Hanks, a former Hump pilot for CNAC. Red served as President of the Maryland Public Health Association, was Director of the Dauphin County TB Society, and has been active in Republican Party politics.